42 Rules for Your New Leadership Role describes practical and effective actions to make a strong start at your new job. "I wish I had this book early in my career! By now, I've seen hundreds of people start leadership roles—from senior executives to customer-facing team leads—some starting brilliantly, some struggling unnecessarily. This book points you to the actions that make all the difference in those critical early months." "This book will be useful when you start and as a framework throughout your career as you take on ever more challenging roles. You'll especially value, as I do, Pam's perspective on building the relationships and fact base that make extraordinary work possible." "Pam and I met 10 years ago when we started our coaching company. Since inception Pam has been one of our most effective and loved coaches. Her clients love her because of how she helps them reach the heights they were capable of. 42 Rules for Your New Leadership Role represents the best of what she has learned over the years. Buy this book, and expect it to change your life!" "When I mentor leaders who want to advance, I offer the guidance you'll find in this book: Be bold in seeing opportunities and tackling tough issues, build your visibility strategically, and take responsibility for your own development. I've heard Pam speak on this, and she gives you the real scoop." "Leaders thrive on making bold moves amid risk. At the same time, the best stay open to learning. Let Pam help you raise your game on both fronts." "Pam was a key partner in transforming my team from a sales support organization to one providing strategic marketing leadership. With her warm and direct style, Pam assisted me in tackling the challenges of being new to the company, new to the industry, and new to leadership level. With my reports (many of whom were also new), Pam developed their leadership skills, strategic thinking, and implementation planning. The wisdom in this slim, yet impactful, book provides new leaders a road map to success." Now that you're stepping up to a new leadership role, you're far less likely to receive useful guidance than earlier in your career. This holds true whether you are in your first manager role or an experienced leader joining top executive ranks. I find this problem is especially acute for new Directors and VPs. You've been hired at these levels for your track record, so people assume you know what to do. However, just because you were successful in your last role doing or managing marketing, accounting, engineering, or whatever you did, doesn't mean you know how to make a strong start at your next job. One-quarter of senior executives promoted from within fail in the first 18 months; one-third of outside hires fail. Many flame-outs can be traced to missteps during their first quarter. More importantly, for the 60–75 percent of leaders who survive into the second year, their effectiveness and trajectory are powerfully affected by choices made as they start. If you're like the technology leaders, marketing executives, and top teams I coach, you might notice how easy it is to become so caught up in fighting fires that you forget to shut off the gas. Or, you suspect you're lousy at certain aspects of leadership, so you ignore them and hope they won't bite you. Or, maybe you never learned the rules in the first place! eadership is an apprenticeship craft. With the trend toward more "flat" organizations, your boss may be stretched so thin that he/she can barely advocate for your team, let alone mentor you. Welcome to your new leadership role—you have a bigger job, in a tough climate, with very little support! Based on two decades of coaching senior leaders, helping executive teams craft strategy, and guiding Stanford MBAs, I describe a proven set of approaches to teach you what you've yet to learn, remind you of what you already know, and inspire you to become the best leader you can be in this job…and your next…and your next. As you read this book, take what I say as a starting point for your own good thinking. Adjust what you find here to serve your team's needs, the market conditions, the cultural context, your goals, and your personal leadership approach. The intense learning curve and unfamiliar environments of a new job make it difficult for your brain to consider options and make decisions as well as you usually do. When brains are overloaded, people tend to rely on what they've done before, even when that didn't work very well or is out of place in the new context. Ironically, this tunnel vision and rigidity is especially true of leaders who have experienced success—people like you who have been promoted or recruited for a new role. So use this book to prompt what you want to do at each phase of your start. Ask yourself what from this material will be useful to you in the week ahead. See what results you're getting, and come back to this process at the end of the week. Consider the rules, make up your own mind, act, observe, and reflect. Repeat. Succeed. Topics include how to gain cooperation from your team, read the business culture at your new level, tee up smart “quick wins”, show others how to work with you, assess the business risks in your new role, make the most of your strengths without overdoing it, work around your weaknesses, use team screw-ups to your advantage, redesign your undoable job, and stay focused on your plan when everyone wants you to fight fires and solve the problems on their desks. Pam gives you specific guidance for each step of those first few critical months. Her recommendations are shaped by current and classic leadership research, as well as fresh insight from her interviews with executives and surveys of leaders at all levels. With her background as executive coach to top Silicon Valley companies, corporate strategist with Bain and Accenture, and Guest Fellow at Stanford GSB's Center for Leadership Development and Research, Pam translates the experiences of thousands of leaders into easy-to-read guidance. Let this book remind you what you did right before, help you avoid common missteps that cause leaders to stumble, and give you new strategies for acing those critical first months. Adjust what you find here to serve team needs, market condition, cultural context, your goals and your personal leadership style. Buy this book when you’re making a step up, moving to a new organization, or for your friends as they move up. This book is also an ideal reference for executive coaches, HR business partners, management trainers, executive assistants, and others who help new leaders be successful. 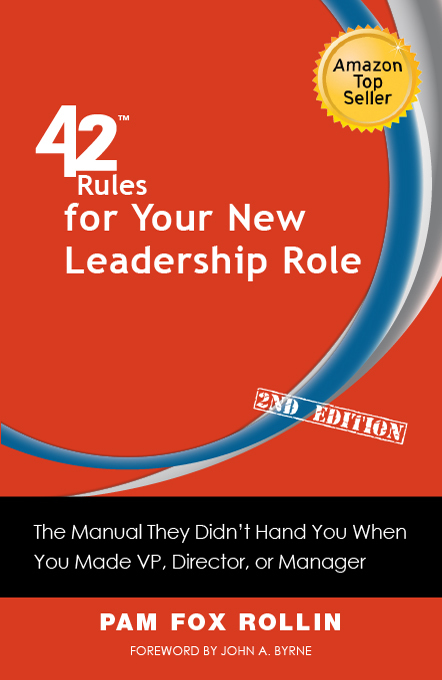 Want a branded edition of 42 Rules for Your New Leadership Role for your company? "Leadership transitions lay the groundwork for more great legacies and painful failures than any other period in your career. Don't let past success fool you into thinking you can wing it. Use a set of practical steps, like these wisely crafted rules, to help you quickly identify blind spots, build allies, and set norms that will assure you (and your team!) get to the next stage." "Pam gives us that rare gem of a book—the perfect blend of proven tactics solidly grounded in the latest research. 42 Rules for Your New Leadership Role offers smart, busy leaders the proven mindsets and practical to-do's to make their strongest start as they rise in the leadership ranks. She also provides great tips on leading change across your organization. Refer back to the book often, and take every chance to hear Pam speak about leadership." "Winning markets is always a combination of a brilliant idea, created in collaboration with people. It is always a combination of the 'what' and the 'how.' Many books will offer you frameworks and models. This book will give you pure wisdom on 'how' you can lead, so you and your company can win." I do not think any consultant could give you better advice. Read her. Follow her. Succeed because of her." "42 Rules for Your New Leadership Role covers all the critical first steps to take and all the dangerous missteps to avoid as you dive into a new role, a new company, and a new culture. Pam's insight into what it takes to not only get off on the right foot but to rise in the best technology-driven companies makes this book relevant in Silicon Valley and around the world." "I work with people who are reinventing their careers, and one of their biggest fears is whether or not they'll be effective in their new jobs. They're especially concerned about taking on a new leadership role. Pam has created an easy-to-follow set of guidelines that lay out the key issues leaders need to think about so that they can feel confident right from the start. Brilliant!" "When making the transition to a new role, even a top performer needs to exercise a different group of muscles. Pam has distilled extensive leadership lessons into simple and actionable guidelines. With the insights from this book, you can make your next start your best ever."